Summer is just around the corner, and many of us will be escaping the heat in pools, lakes, rivers, and other water-based recreation. If you’re a parent, water safety will be on your mind. Making sure our kids know how to swim is one of the best defenses we have. At the age of 13, Jan Emler began lifeguarding and teaching swim classes at her local YWCA, in Kansas City. In 1975, she started the Emler Swim School, and continues to be active in the operation of each location. As a result of Emler’s commitment to teach swimming and water safety, the school has many awards, including 4 years of “Best Swim Lessons in the Dallas/Fort Worth Metroplex”, as named by DFW Best Of Metroplex. Built in 2010, the Frisco location at Stonebrook Parkway and Preston boasts the school’s first 40 X 40 pool, where parents can watch from the pool deck or from a spacious viewing area. Like the other Emler pools, it is a comfortable depth (around 4 ft) for lessons, and the saltwater is maintained with a high-end UV filtration system to assure purity. I spent some time with Hunter Cook, the Frisco Site Director, to learn more about the Emler philosophy and methods. Hunter reaffirmed what I had gleaned from the Emler web site: The school’s primary goals are “making sure children are safe in and around the water” and that they “develop a love of and healthy respect for water”. The teachers at Emler are trained through certification courses and receive 40 hours of in-water training, all focused on teaching kids to swim and to be safe around water in a fun, nurturing environment. The emphasis on water safety is obvious. Hunter explained that, in addition to the swim goals that are set for each class, every child practices “Jump, Turn, Swim” at every lesson. This simple lesson teaches them that, if they were to fall in water, they should first turn around (since the nearest exit is often behind them) and swim to dry land. This frequent practice helps prevent panic if a child falls in water, because they know how to handle it. (See some stories of children who used this technique to rescue themselves at the “One Brave Day” portion of the web site.) The child will also practice this clothed, once per semester, as this resembles what is likely to happen in an accident situation. Emler’s commitment to water safety has led to a partnership with Lonestar Lifesavers. In addition to fundraising, Emler hosts a program in which Emler teachers volunteer their services to teach swimming in lower income areas, where the apartment complex may have a pool but the kids are less likely to have formal lessons. Emler is also a charter member of the National Drowning Prevention Alliance and the U. S. Swim Schools Association. Swim classes at Emler focus on a semester based curriculum. Students in semester classes attend lessons once per week. The semester based programming allows for continuity of learning, so that the child doesn’t try to cram too much in all at once and then not get a chance to practice for long periods of time. Also offered are “Summer Prep” (about 2 months, with 2 lessons per week), summer camps (2 week sessions, with daily lessons), and private lessons (on a customizable schedule). All the classes have established goals and the students are monitored for progress. In fact, Emler offers a guarantee that you’ll be happy with your child’s progress. 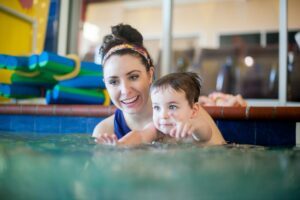 Classes at Emler are available for all ages, and the student:teacher ratios are low (no more than 4:1 in most classes, 6:1 when parents are in the water with their children). The array of levels looks intimidating to a parent, but allows for each student to take-part in the class that best matches his or her abilities. This creates an almost customized swim plan. And, if your little one masters the current class early, he or she may move to a more advanced class. Hunter emphasized the school’s focus on teaching children to not fear the water, but to enjoy it, while remaining aware of risks. The youngest students at Emler are learning to be comfortable in the water. (They even offer a free Bathtime Babiesⓒ course for infants between 2 and 6 months.) All lessons center on fun: songs are incorporated, as well as games, and there’s a cool slide they get to use. As they get older, and their swimming improves, they may even join the school’s recreational swim team, which emphasizes mastery of the four competitive strokes and hosts monthly, low pressure, swim meets. When children learn to swim, they not only develop an important safety skill, but they also get the key to a wealth of activities that offer both health benefits and pure, simple fun. As Hunter emphasized, the teachers at Emler are “all people who love kids” and are dedicated to teaching them this vital skill. Check them out, you won’t regret it! For more information, visit their website, call 469.234.SWIM (7946), or email.